Chicago has issued a $58.05 million building permit for a 26-story residential apartment building at 1136 Wabash Ave. The project includes 320 dwelling units with first floor retail, 143 parking spaces on floors two, three and four. Lend Lease (US) Construction is listed as the general contractor, while Pepper Construction Co. and Crouch-Seranko Masonry LLC are both named as masonry contractors. Other subtrades include: Electrical – Bonus Electric; plumbing – Hill Mechanical Corp.; refrigeration and ventilation – Advance Mechanical. Chicagoarchitecture.org reported in May that the Chicago Plan Commission had approved the project, which wraps around the Roosevelt Hotel building on the corner, with both Wabash and Roosevelt Rd. footage. The Roosevelt Hotel is no longer a hotel, it is student housing, going by the name of Roosevelt Student Apartments. The new building is also expected to be student housing. It was designed by friends-of-the-blog, SCB, for prolific student houser, CA Ventures. 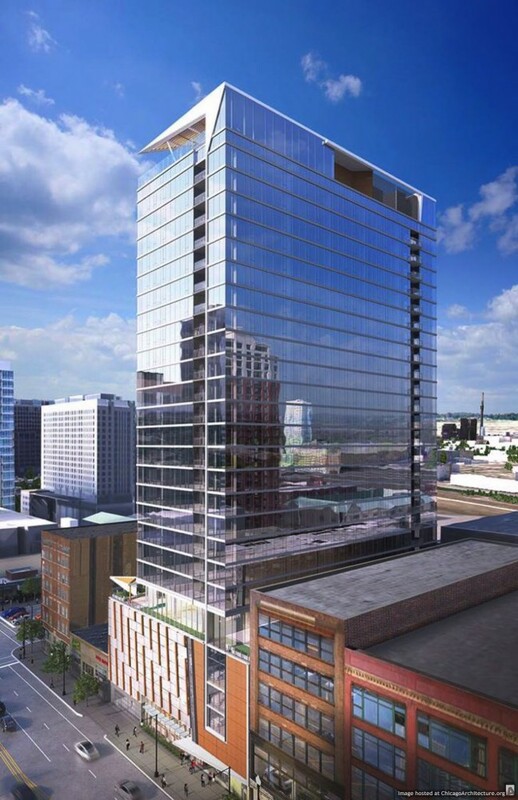 A 26-story tower will rise on the South Wabash Ave. side of the lot, while the one-story retail space on the Roosevelt Road side will remain as is. Gary Kohn of SCB is listed as the architect.